The project was called, “Who’s the Biggest Egg Head.” We had seven volunteers and a silly “Egg Head” jar that was made with each volunteer’s picture on it to collect donations. 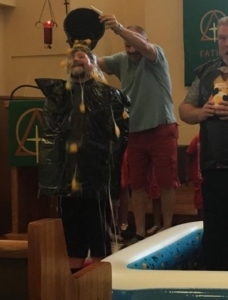 The idea was for the VBS kids to be encouraged and for families to be invited back on Sunday following VBS to see the Egg Head contest winner revealed. We wanted something that would attract all ages, and get our congregation laughing & excited – a fellowship builder. As a fundraiser, we never imagined it would be this successful, with $350 collected for children and youth ministries. And guess who the biggest Egg Head was? It was Pastor Carstens. So … he got to have all the eggs for his votes poured on his head. A good time was had by all.